As published on J-Source.ca and reprinted by World News Publishing Focus and Danielle magazine. And so the Great Canadian Newspaper Roll-up has begun. This was predictable once the Competition Bureau rubber-stamped Postmedia Network’s $316-million takeover of Sun Media last year. As a result, Postmedia now publishes 37.4 per cent of Canadian daily newspaper circulation, according to my calculations. It is in the three westernmost provinces, however, where its grip is truly unprecedented. In B.C., Alberta and Saskatchewan, it now owns eight of the nine largest dailies and accounts for a whopping 75.4 per cent of daily newspaper circulation. It owns both daily newspapers in Calgary, Edmonton and Ottawa, as it already did in Vancouver. In all four cities, newsrooms will be merged. Residents of these burghs should be outraged, as should all Canadians who cherish what little remains of journalistic independence in this country. Not to mention those who put any value on promises made. The immediate angle that emanated from certain journalistic quarters in response to this news was a hand-wringing wail that it was only more evidence that newspapers are dying. 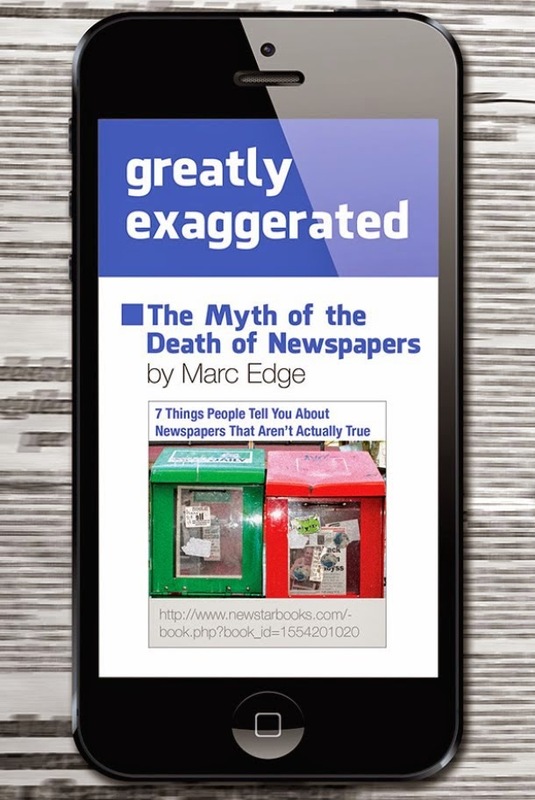 Nothing could be further from the truth, as I explain in my recent book, Greatly Exaggerated: The Myth of the Death of Newspapers. A quick glance at Postmedia’s latest financial statement shows it recorded operating income of $42.5 million on revenues of $251 million in the first quarter of its 2015-16 fiscal year, for a very healthy profit margin of 16.9 per cent. The self-serving myth that newspapers are dying is one that publishers have promoted to advantage for decades. It was used with great success in the U.S. after the Supreme Court ruled illegal in 1965 the increasingly popular “joint operating agreements” between newspapers that went into business together, set advertising and subscription rates jointly and split the profits. Newspapers lobbied furiously for an exemption from U.S. antitrust laws after the Supreme Court ruling, claiming that under the prevailing natural monopoly theory of newspapers there would otherwise be only one daily eventually left in each city. The result was the Newspaper Preservation Act of 1970, which sanctified newspaper marriages, but only if they maintained journalistic competition by keeping separate newsrooms. In Canada, joint operating agreements sprang up on the west coast in the 1950s. The Victoria Times and The Colonist amalgamated mechanical operations in the early 1950s, but kept separate newsrooms until the newspapers were merged by Thomson in 1980. After the Vancouver Sun and the Daily Province combined non-editorial operations in 1957, however, the Restrictive Trade Practices Commission ruled the merger an illegal combination between competitors, as I document in my 2001 bookPacific Press: The Unauthorized Story of Vancouver’s Newspaper Monopoly. The owners of the Sun and Province, however, pointed to the closure on both sides of the border of smaller, weaker newspapers as evidence that newspapers were dying, and they were allowed to go into business together. The Restrictive Trade Practices Commission made them promise to keep separate newsrooms forever, which now seems to have been officially forgotten. The events of “Black Wednesday,” which saw the Ottawa Journal and the Winnipeg Tribune close on August 27, 1980, prompting a Royal Commission on Newspapers, was proof positive to many of the natural monopoly theory of newspapers. The 1981 Royal Commission report pointed to the rising tide of ownership concentration, as had a 1970 Senate report on mass media. Both urged measures to stem the inexorable economic forces that drove industry consolidation, but nothing was ever done. The Senate report recommended a Press Ownership Review Board to oversee changes in ownership, along with government subsidies to encourage a competing bare-bones “Volkswagen press.” The Royal Commission urged limits on chain ownership of newspapers, but none were enacted as the Liberal government of Pierre Trudeau was replaced by the Progressive Conservatives of Brian Mulroney. But then a funny thing happened in those two cities and others where only one newspaper remained. Colorful tabloids, modeled after the wildly successful Toronto Sun, sprang up as competition to monopoly broadsheets in Ottawa, Winnipeg and Edmonton. Soon there was an entire chain of tabloids Suns across Canada. Even staid old Southam converted its dowdy old Vancouver Province to tabloid format in 1983 to stave off extinction, and it thrived with a younger readership, which in turn attracted advertisers trying to sell to that valued demographic. I guess it just shows the value of promises where hedge funds are concerned. Marc Edge is a professor of media and communication at University Canada West in Vancouver. Can Canada's Media Be Fixed?